Cooking in a foil packet is one of the easiest ways to put a campfire meal together. All you have to do is stick all your ingredients in foil and throw it on the fire. Although recipes for cooking food directly in the coals isn’t a foil packet recipe, we’re putting them here for now. We don’t have anywhere better to put them and this seemed like as good of a place as any, especially since the cooking style is similar. They’ll eventually get moved to their own category. There are several ways to make a foil pack for cooking in a campfire. Three are covered in our post How to Make a Foil Pack for Foil Packet Cooking. We’ll generally reference this post when giving instructions for each recipe so that you’ll know which method is best for that particular one. Some recipes will call for other specialized methods, which we’ll explain in the recipe posts themselves. 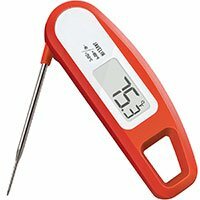 Use an instant read meat thermometer to check the temperature in the pack. This will keep you from constantly having to open the pack to check doneness. Just poke the thermometer probe right through the foil and into the meat. Move your foil pack around while cooking to keep it from getting hot-spots. Only use heavy duty foil, and plenty of it. Its better to use too much and have to fold it over, rather than have to fish your food out of the fire. Spray the foil with a little non-stick cooking spray to help keep it from sticking. Try to cut ingredients all to the same size, if possible. This will ensure everything cooks in about the same amount of time. Put the dense foods, like meat or potatoes, at the bottom of the foil with your other ingredients on top, so that they’ll cook first. Don’t put the foil directly in a fire. Put it on hot coals.